Both Trump and Hillary Clinton have issued statements condemning the Islamic terror attack in Tel Aviv. This was Trump's statement. I condemn, in the strongest possible terms, the outrageous terrorist shootings that took the lives of at least four innocent civilians and wounded at least twenty others in Tel Aviv yesterday. The Israeli security forces’ investigation is ongoing, but some facts have already emerged — and they are grim. Just as fast as the condolences arrive from the civilized world is the praise arising out of the uncivilized one. Hamas praised the attack, calling the attackers “heroes.” Reports out of Hebron indicate that residents of the terrorists’ hometown lit up the night sky with celebratory fireworks. 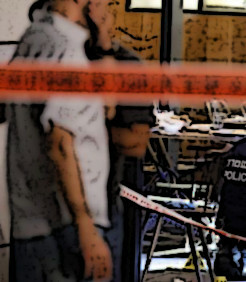 One Palestinian “news organization” even referred to the shootings, in which the assailants dressed up as observant Jews, as a “Ramadan treat.” The leader of Hamas called the injured terrorist a “hero.” How despicable! The American people stand strong with the people of Israel, who have suffered far too long from terrorism. Israel’s security is a matter of paramount importance to me and the American people. But while even Hillary had to say something, there is no press release from the Sanders campaign condemning the brutal terror attack against civilians. That makes him the only candidate in the race not to have issued such a statement. While Bernie Sanders has been notoriously weak on foreign policy, he has also taken his campaign in an overtly anti-Israel direction. From the lie about Israel killing 10,000 "innocent people" in Gaza, the Simone Zimmerman scandal, the appearances with members of the Students for Justice in Palestine hate group and the push for an anti-Israel Democratic platform, his campaign has been ugly. And it's hard not to wonder whether Bernie's silence in the face of evil isn't also a message.